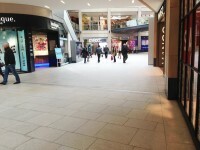 Services / facilities within the building include Restaurants, Cafes, Shops, Retail Outlets and a Cinema. 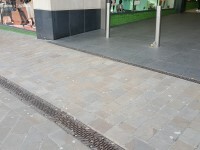 Related link Trinity Leeds Boar Lane Car Park. 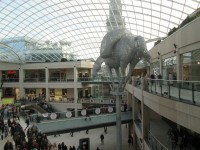 Trinity Leeds has a mixture of retail shops, cafes, coffee shops, restaurants and bars, a cinema and a Customer Service Lounge. 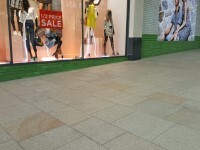 For more information please visit the Trinity Leeds website. You are on Opening Times (Store Opening Times). Skip to the next section. Opening hours for the Trinity Kitchen, cinema, restaurants and bars vary. The nearest National Rail station is Leeds. 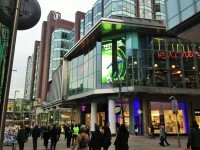 Trinity Leeds has its own car park. 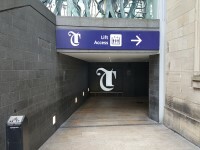 Please see the Trinity Leeds Boar Lane Car Park access guide for more information. 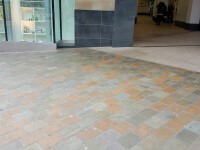 You are on Outside Access (Boar Lane Entrance). Skip to the next section. This information is for the entrance located off Boar Lane. This entrance gives direct access to Level -1. 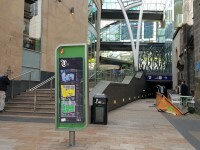 You are on Level Change (Boar Lane Entrance). Skip to the next section. 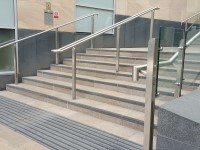 The ramp/slope is located in front of and immediately beyond the lift entrance and in front of the steps. 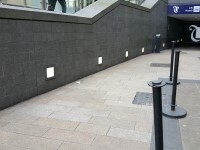 The step(s) is/are located leading up to the lower ground floor. 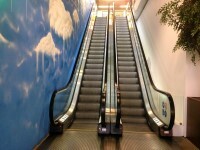 The slope leads directly to the lift to avoid the steps. 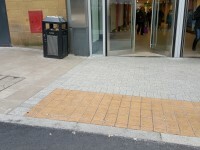 You are on Outside Access (Briggate Entrance). Skip to the next section. 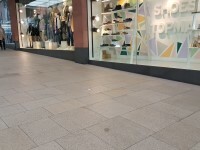 This information is for the entrance located off Briggate. The width of the door opening is 825cm (27ft 1in). 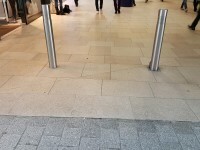 There are bollards in the entrance walkway. 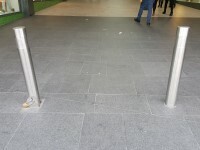 The clear width between the bollards is 146cm (4ft 9in). 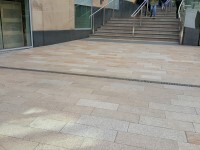 This entrance gives direct access to the Lower Ground Level. 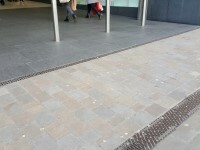 You are on Level Change (Briggate Entrance). Skip to the next section. You are on Outside Access (Albion Street East Entrance). Skip to the next section. This information is for the entrance located on the east side of Albion Street. There are 2 sets of double doors at this entrance. You are on Level Change (Albion Street East Entrance). Skip to the next section. You are on Outside Access (Albion Street West Entrance). Skip to the next section. This information is for the entrance located on the West side of Albion Street. The width of the door opening is 857cm (28ft 1in). 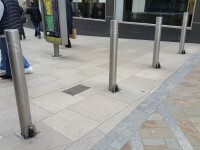 The width between the bollards is 135cm (4ft 5in). You are on Level Change (Albion Street West Entrance). Skip to the next section. 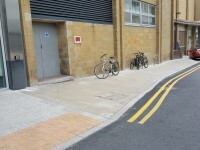 You are on Outside Access (Lower Basinghall Street Entrance). Skip to the next section. This information is for the entrance located off Lower Basinghall Street. The set on the right are automatic and the set on the left are manual. 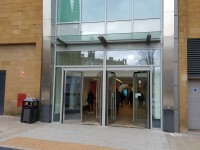 The Lower Basinghall Street entrance is where visitors can be met by hosts of the centre. 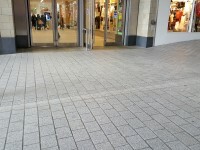 The entrance is located near the Park Plaza Hotel, which has a convenient drop off point. 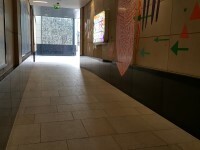 You are on Level Change (Lower Basinghall Street Entrance). Skip to the next section. 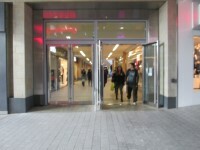 You are on Outside Access (Commercial Street Entrance). Skip to the next section. This information is for the entrance located off Commercial Street. 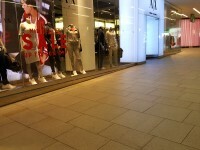 The width of the door opening is 800cm (26ft 3in). 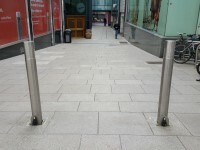 The width between the bollards is 146cm (4ft 9in). 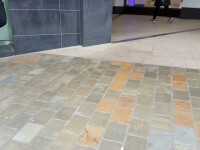 This entrance gives direct access to the Ground Level. You are on Level Change (Commercial Street Entrance). Skip to the next section. 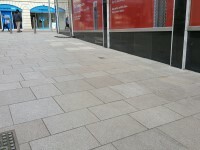 You are on Outside Access (Albion Street and Commercial Street Entrance). Skip to the next section. 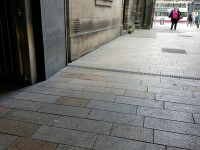 This information is for the entrance located off the junction of the two streets. 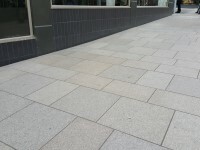 You are on Level Change (Albion Street and Commercial Street Entrance). Skip to the next section. You are on Outside Access (Bank Street Entrance). Skip to the next section. This information is for the entrance located off Bank Street. The width of the door opening is 236cm (7ft 9in). You are on Level Change (Bank Street Entrance). Skip to the next section. You are on Outside Access (Bond Street Street). Skip to the next section. 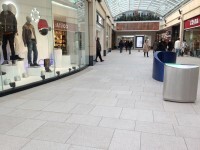 This information is for the entrance located on Bond Street. 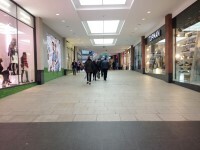 The ramp/slope is located throughout the shopping centre. 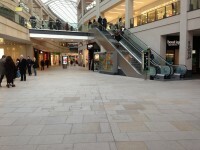 There are various easy ramps/slopes located throughout the centre. You are on Customer Service Lounge. Skip to the next section. 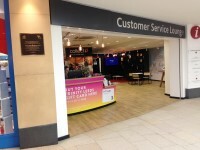 The Customer Service Lounge is located on the first floor. The lounge is open 09:00 - 20:00 Monday to Saturday and 11:00 - 17:00 on Sunday. The lounge has no doors and the entrance width is 6m. The lounge is equipped with tables, chairs, lounge style seating and a television. Music is played within the lounge. 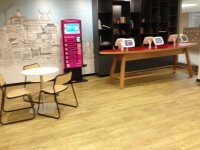 There are 3 separate reception desks, one of which has a lowered section. 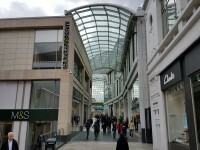 There are centre hosts who operate throughout the centre. 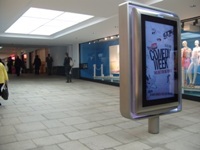 These hosts will assist visitors where required and have iPads to assist with directions and the locations of individual retail units. 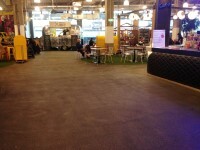 The lounge also offers a concierge service and Shop and Drop. You are on Customer Facilities. Skip to the next section. 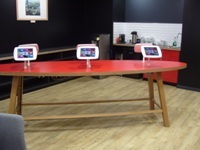 There are fixed iPads located on a desk within the Customer Service Lounge which are available for customers to use to search for information. 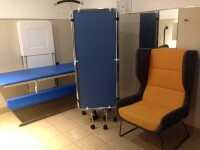 The Customer Service Lounge has 6 complimentary wheelchairs for hire to those customers who have mobility impairments. 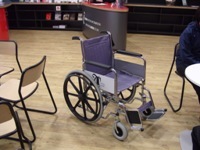 To book a wheelchair, please contact the Customer Service Lounge on 0113 394 2415. 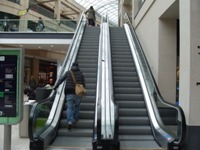 The floors which are accessible by escalator are LG, G and 1. 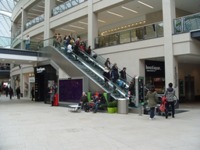 The escalators are located in various locations around the centre. You are on Lift (Main Centre Lift). Skip to the next section. 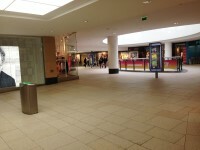 The lift is located to the right as you enter the Boar Lane entrance. 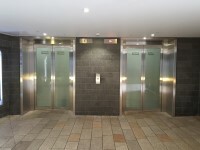 The floors which are accessible by this lift are -1, LG, G and 1. 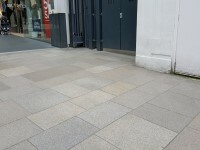 The lift is approximately 7m (7yd 1ft) from the Boar Lane entrance. 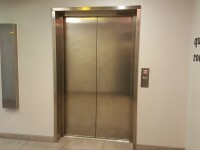 The dimensions of the lift are 200cm x 130cm (6ft 7in x 4ft 3in). All the centre lifts have audio support. You are on Lift (Restaurants). Skip to the next section. 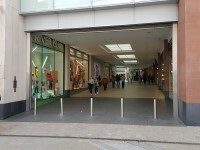 The lift is located outside the centre on Boar Lane. 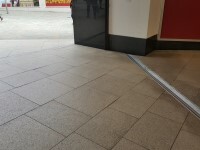 The floors which are accessible by this lift are 0 and 3. 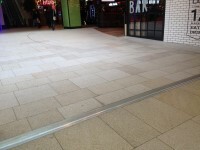 The lift is approximately 42m (45yd 2ft) from the Boar Lane entrance. The dimensions of the lift are 190cm x 180cm (6ft 3in x 5ft 11in). 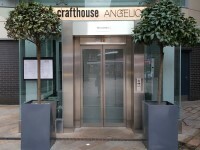 This lift allows access to the restaurants from street level. You are on Trinity Kitchen. Skip to the next section. 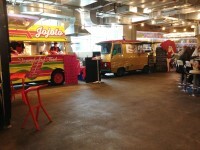 Trinity Kitchen is an eating area with vibrant restaurants and street vans. 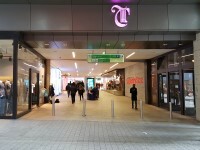 Trinity Kitchen is located on the First Floor of The Trinity Shopping Centre. You are on Lift (Trinity Kitchen). Skip to the next section. 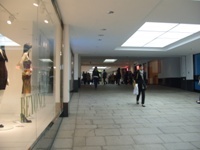 The lift is located ahead as you enter the Bond Street entrance. 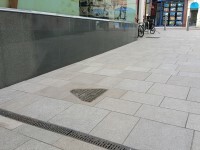 The lift is approximately 8m (8yd 2ft) from the Bond Street entrance. The dimensions of the lift are 157cm x 208cm (5ft 2in x 6ft 10in). 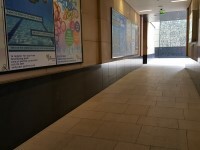 The facility is located on level 1, in the centre toilet area. 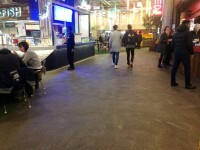 The dimensions of the facility are 395cm x 300cm (12ft 12in x 9ft 10in). 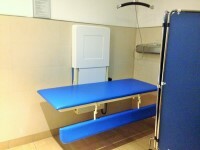 The length of the facility changing bench is 170cm (5ft 7in). The sling is attached to the hoist by loop. 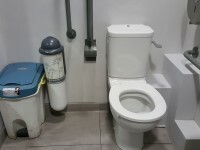 The transfer space on the right as you face the toilet is 104cm (3ft 5in). 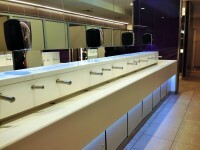 The changing place has 2 sinks. One is placed at a height of 74cm (2ft 5in) and the other at a height of 60cm (2ft). 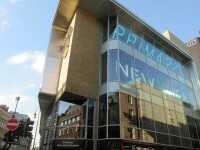 The changing place is located on the first floor between Mamas & Papas and Everyman Cinema. You are on Accessible Toilet (Level 1). Skip to the next section. 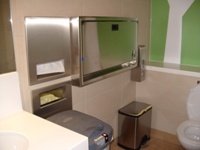 This accessible toilet is located on level 1, in the centre toilet area. 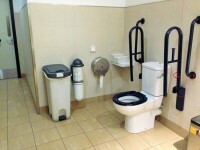 The width of the accessible toilet door is 110cm (3ft 7in). 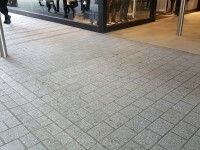 There are 2 accessible toilets in this area. The toilets are similar but one has the transfer space on the opposite side. You are on Accessible Toilet (Trinity Kitchen). Skip to the next section. 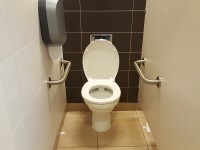 This accessible toilet is located on the fifth floor. The width of the accessible toilet door is 104cm (3ft 5in). 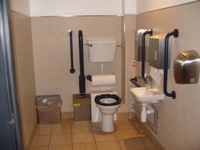 The dimensions of the accessible toilet are 175cm x 210cm (5ft 9in x 6ft 11in). You are on Standard Toilet(s) (Family Toilets). Skip to the next section. Baby change facilities are located in the family toilets. 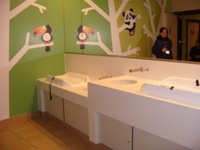 There are 3 separate family toilet rooms which have standard toilets for adults and low level toilets for children. 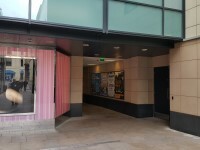 The standard family toilets are located on the first floor between Mamas & Papas and Everyman Cinema. 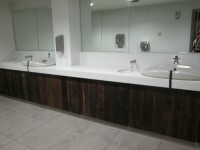 Standard toilets and baby changing facilities are also located on the fifth floor of Trinity Kitchen. 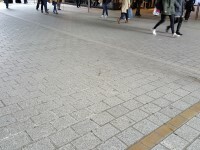 The female and male toilet facilities that were surveyed are located in the centre toilet area. 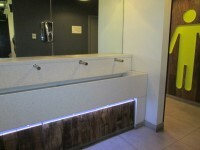 The standard toilets are located on the first floor between Mamas & Papas and Everyman Cinema. You are on Baby Changing and Feeding. Skip to the next section. 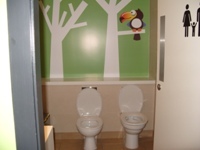 The centre has baby changing facilities available within the family toilets and also a separate room for baby changing. The separate room has 3 changing areas which are at a height of 90cm (2ft 11in) and one area at a height of 65cm (2ft 2in). The centre has a separate room for feeding babies. 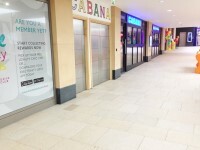 The baby change and feeding rooms are located on the first floor between Mamas & Papas and Everyman Cinema. Staff do receive Deaf Awareness training.